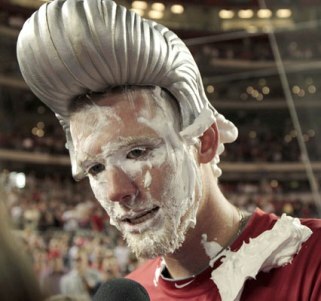 Stephen Strasburg endures some rookie hazing after making a major league debut fit for a King (Photo: AP). Unless you just crawled out from under a rock, you already know that Stephen Strasburg was absolutely fantastic in his major league debut, even though the Pirates’ lineup he faced still suggested minor leagues. Amazingly, by striking out 14 batters in only seven innings, he may have actually exceeded what were incredibly high expectations. Cooperstown here he comes, right? Judging by some of the articles written in the afterglow of Strasburg’s gem, not to mention Bob Costas’ constant evocation of Walter Johnson during the game, you’d almost think no one else has ever possessed a blazing fastball and knee bending hook. As great as Strasburg’s raw stuff appears to be, however, he is really not such a freak. In fact, Strasburg’s arsenal resembles very closely that of a young A.J. Burnett and Kerry Wood, just to name two. Both very good pitchers in their own right, each failed to meet expectations due to a combination of injuries and inability to harness their talent on a consistent basis. Overcoming that combination, which is the nemesis of every pitcher, is what will define Strasburg’s greatness, not one dominating performance at the beginning of his career. Only time will tell how great Strasburg will be, and even after such a dominating opening performance, the odds are still against him. Olney’s quote above illustrates the kind of hyperbole that has almost overshadowed the performance itself. I haven’t seen the quotes to which Olney refers, but I have a hard time believing that Hershiser, Smoltz and Schilling have all never seen the likes of Strasburg. What’s more, Olney even credits Strasburg’s greatness for Delwyn Young’s two run homer (that’s right, Strasburg did not retire every batter he faced). Apparently, Olney suggests, only a unique pitcher like Strasburg could give up such a home run. Against any other mortal, like say Ubaldo Jiminez or Roy Halladay, Young would have only hit a double in the gap. Go figure. I am not trying to rain on the Strasburg parade. Quite the contrary. I’d love to see him realize his potential and help boost the game of baseball in the nation’s capital. However, it is unfair to all the great pitchers in the game to treat the new toy as if it is an entirely different concept. If after a full season or two, Strasburg is still averaging 98mph and striking out hitters at an absurd rate, maybe then we can start the coronation. In the meantime, let’s just hope his arm and shoulder can stay healthy enough to allow us to enjoy his abundant talent.